Local Natives (previously known as Cavil at Rest) is an American indie rock band based in Silver Lake, Los Angeles, California, United States. Their debut album, Gorilla Manor, was first released in the UK in November 2009, and later released in the US on February 16, 2010. The album received mostly positive reviews and debuted in the Billboard 200 and at No. 3 in the New Artist Chart. Their second album, Hummingbird, was released in January 2013. Their third album, Sunlit Youth, was released in September 2016. 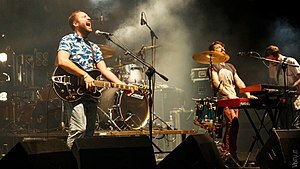 Their sound has been described as "afropop-influenced guitars with hyperactive drumming and hooky three-part harmonies". Everything the band creates comes from a complete collaboration between their members, from songwriting to artwork. Their debut album, Gorilla Manor, was named after the house they all shared in Orange County, where most of the album was written. “It was insanely messy and there were always friends over knocking around on guitars or our thrift store piano,” said Hahn. “It was an incredible experience and I’ll never forget that time.”  The self-funded Gorilla Manor was recorded by Raymond Richards in his own Red Rockets Glare Studio, in West Los Angeles, and was produced by Richards and the band. Since 2012, the band has been joined with Nik Ewing as their touring bassist but it was announced at Austin City Limits that he has become an official member on October 11, 2013. In August 2014, at a concert in Salt Lake City, Utah, as part of the Twilight Concert Series, the band announced that they had already begun work on their third studio album. On April 29, 2016, Local Natives released a new single "Past Lives," saying, "The world is not static, it’s made new over and over again. But we tend to live the same patterns in a loop, loving the same way, wrestling the same demons, the same dynamics playing out around us again and again. Untangling every moment and decision that led us to where we are now can make fate feel concrete, inescapable. But our world is not fixed, it’s constantly reemerging, and we can change it into whatever we want.” In May 2016, the band premiered the first songs from the album live. The album Sunlit Youth was released on September 9, 2016. ^ "Reviews for Gorilla Manor by Local Natives". Metacritic.com. Retrieved 2015-07-12. ^ "Local Natives Debut On Billboard Top 200 & No. 3 On New Artist Chart". AltSounds. February 24, 2010. Retrieved 2015-07-12. ^ "Local Natives Sign to Frenchkiss". Pitchfork.com. November 30, 2009. Retrieved 2015-07-12. ^ a b c d "Frenchkiss Records". Frenchkiss Records. 2013-01-29. Retrieved 2015-07-12. ^ Lester, Paul (June 3, 2009). "New Band Of The Day". The Guardian. London. Retrieved May 11, 2010. ^ "Album Reviews: Local Natives: Gorilla Manor". Pitchfork.com. February 15, 2010. Retrieved 2015-07-12. ^ "Local Natives add headline shows to first Australian tour". Abc.net.au. November 18, 2010. Retrieved 2015-07-12. ^ "Unfortunate News". Outtasightblog.tumblr.com. March 18, 2011. Archived from the original on August 23, 2011. Retrieved 2015-07-12. ^ "Lollapalooza Sun Hands Performance". Youtube.com. Retrieved 2015-07-12. ^ Lau, Melody (2013-02-25). "Local Natives Growth Spurt". Exclaim.ca. Retrieved 2015-07-12. ^ "Local Natives' Big Vaulted Ceilings". Laweekly.com. Retrieved 2015-07-12. ^ "Staring At Our Ceilings: Local Natives Come to Salt Lake City". Saltartists.com. Retrieved 2015-07-12. ^ "We Caught the First Preview of Local Natives' New Album at a Surprise LA Show - Noisey". noisey. Retrieved 2016-09-13. ^ Mongredien, Phil (2016-09-11). "Local Natives: Sunlit Youth review – clever but overpolished indie". The Guardian. ISSN 0261-3077. Retrieved 2016-09-13. ^ "Local Natives in Concert : NPR". Npr.org. Retrieved 2015-07-12.